Grandma Krasuski and my dad, Richard Krasuski, in Grandma's kitchen (c. 1957). My grandma, Helen Krasuski, just turned 94 years old. She lives in a nursing home now, and not by choice- believe me. 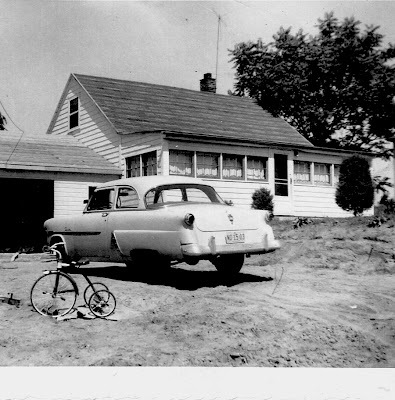 She lived in the house my grandpa, Joe Krasuski, and his brothers built in Brighton, Michigan until she was 92. The house that Grandpa built on Ore Lake in Brighton, Michigan. When I was young, Grandma would cook like no one’s business. She made everything- from pickles to many different kinds of pierogis to Czarnina (duck blood soup- I think my dad was the only one interested in that). And the cookies she would bake at Christmas? I could only dream about baking like that. On Christmas Eve, my mom and dad would pile Brenda, Max, and I in the car and go to Grandma and Grandpa’s house, about a forty-five minute drive. 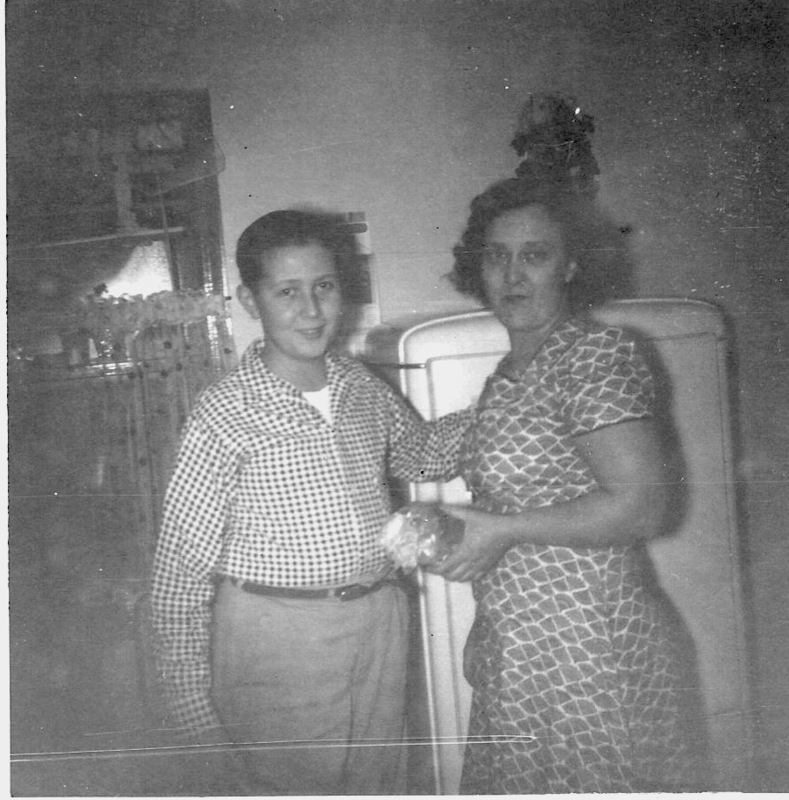 Grandma would have a delicious spread of homemade delicacies (some Polish and some not) for my family, my cousins, and Aunt Elaine and Uncle Jim. We would all crowd around the table in her tiny kitchen and eat until we were stuffed. After dinner, Grandpa would make all the kids line up, and he would smack our stomachs to see if we had eaten enough before we were allowed to open presents. I would usually cry, but Grandpa would not relent for babies like me. He thought it was the funniest thing ever. A smiling Grandma (she was generally a very stern lady) would always put out a big tray of incredible homemade cookies - I can still remember how each one tasted! - and send us home with a little pie tin full of them. It was a magical night, and every Christmas Eve when David and I walk the dogs, I look into all the lighted windows at all the families and remember those wonderful Christmas Eves, despite Grandpa and his stomach smacks! Grandma was an incredible cook, and I bet she still would be, given the chance. Her birthday was two weeks ago today, and I was thinking about her cooking. I decided to make something I’d never made, Golabki (or stuffed cabbage) in her honor. Grandma made excellent stuffed cabbage! She did not give me the recipe, but I made it from what I remembered of the taste. Happy Birthday, Grandma- the Golabki was outstanding, and it did taste like yours! Boil, chop, sauté, mix. Very simple! Pre-heat oven to 350 degrees. Boil salted water in a big pot. Peel the leaves off the head of cabbage and drop them, three or four at a time, into the boiling water. Cook for about three or four minutes, then remove from the water with tongs and plunge in ice water*. When all the leaves have been cooked, reserve one cup of the cooking liquid to the side and dump the rest. You will use the Dutch oven to cook the Golabki. Drain and dry the leaves after cooled. Heat a large sauté pan, and add the butter. Add the mirepoix (onions, carrots and celery) and cook until translucent. Add the garlic, and cook for about three more minutes. Remove from the heat and cool. Put the ground meats in a large bowl. Add the cooled cooked rice and the cooled mirepoix, salt and pepper. Of course, you can not taste the mixture to see if it has enough seasoning, so use your best judgement. You must season this mixture, but remember that the cabbage is salted, and the sauce will be, too. Mix with a wooden spoon. Starting with the largest leaves, take one leaf of cabbage, and flatten it out on the counter. Add a small fistful (depending upon the side of your leaves) to the center of the leaf, fold the bottom and sides around and roll up. Do this with each leaf until you run out of meat mixture. If you have leftover small leaves, line the bottom of the Dutch oven with these. Place the little stuffed cabbages (opening side down) in the bottom of the Dutch oven. When all are in, pour the diced tomatoes and the reserved cabbage water over the top. Add the red pepper flakes, salt and pepper, and the whole clove. Cover. Cook at 350 degrees for about an hour, depending on your oven. Remove and serve with mashed potatoes; or, cool and put in the fridge. Golabki are always better the next day (always with mashed potatoes)! Did I mention that you must serve Golabki with mashed potatoes? * When you blanche vegetables, you cook them briefly in small batches in salted, boiling water. 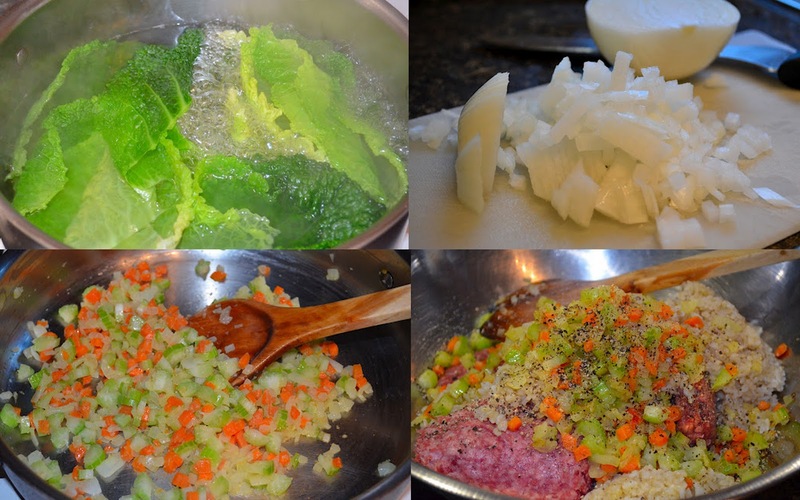 Immediately plunge the vegetables into an ice water bath upon removing them from the boiling water. Vegetables will stay colorful and crisp.